Citrus Sign Studio recently had the pleasure of working on window decals with Sugarboo & Co., a unique new store featuring fine quality art and fanciful goods for the home. Sugarboo & Co. is new to Orlando, Florida and they wanted to introduce their brand in the marketplace before they opened their storefront for business. This store is located in the recently renovated Disney Springs Town Center, and their logo and name had to capture as many eyes as possible. 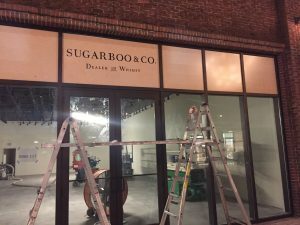 During the construction process, Sugarboo & Co. needed to hide unsightly work areas while giving prospective customers information about their business and when the store would be opening. Citrus Sign Studio created a coming soon window decal display that covered all of the windows and doors of the storefront to A) hide construction and B) to excite future customers. This type of window signage is temporary, can easily be applied and removed, and makes a dramatic impact on your company’s storefront appearance. Window decals are also a great way to provide information on your company’s contact information such as phone number, website address and business hours which is important for any new business as you open. Prospective customers must know how they can get in touch with you, and when your shop will be open. In addition, window decals are perfect for announcing grand openings, promotional sales events and even seasonal holiday updates. They can be updated regularly and will keep your storefront looking refreshed and enticing. Window signage can help your business stand out from the competition and help drive sales. Opaque Window Decals: These decals obscure visibility on both sides of a window and are often used on floor-to-ceiling glass panels like we did for Sugarboo & Co. This is a great solution for many retailers during a messy construction period. Frosted Window Decals: If you are searching for window signage that allows you to see out but prevents others from seeing inside, then one-way visibility frosted window decals are your best choice. 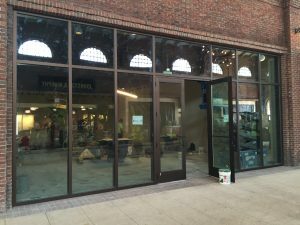 Clear Window Decals: This solution allows for the most light to pass through your window and can be placed on the interior or exterior of your storefront. We print on transparent vinyl, making the decal clear. At Citrus Sign Studio, we can customize your retail window signage to best meet your needs. We will ensure that your retail store has eye-catching signage, while offering recommendations that fit within your budget and timeframe. We will provide mock-ups of your design for your approval and then we print and install your window signs. It’s that simple. If you are ready for new window signage, request a free quote today.